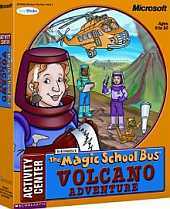 Fasten your seatbelts everyone, and Join Ms. Frizzle and her class as they go on a field trip to explore a volcano. Explore inside the bus as well - click on the globe to learn about major volcanoes from around the world; click on the puzzle piece to play a jigsaw mini-game. The plants take you to a desolate volcanic island that you can "green" up by planting trees and flowers and building a house. The magnifying glass will teach you new facts about all kinds of volcanic rock; you can make your own volcano and watch it blow and you can compare four large volcanoes in various ways. Outside the bus you will learn about the scientific instruments used in measuring volcanic activity and predicting eruptions, watch an island being formed, and view pictures by clicking the camera. Click on the little yellow bus symbols and find mini-games; in Rub-a-dub-dub Sub you'll navigate a submarine under the ocean with the mouse, trying to avoid dangerous enemies; in Leaping Lava, you'll jump the bus over a lava flow by leaping on rocks and debris.